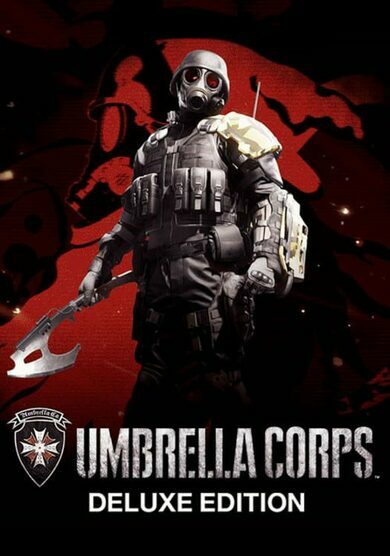 Umbrella Corps Deluxe Edition pairs up the base game with all Deluxe content, including weapons, emotes, skins, new patches, and the ability to turn yourself into beloved Resident Evil characters! Immerse yourself in fast-paced third-person shooting action with Resident Evil: Umbrella Corps, brought to life by Capcom. Umbrella Corporation is infamous in the Resident Evil Universe for doing genetic experiences that resulted in the terrible incident in Racoon City. Although it was shut down in 2003, the legacy it left behind is continued by other bio-weaponry companies! It is now up to you to get yourself involved in battles that take place in areas infected by freaky, human deforming viruses. Play online or in a all-new single player campaign as you take part in super high-intensity matches that don't give you any space or time to hide!